There was a mighty roar from the home dressing room at Old Trafford when Tom Smith reached his half-century with the final ball before lunch. Of course, there is always celebration when a teammate reaches a milestone but this was different; this was special. 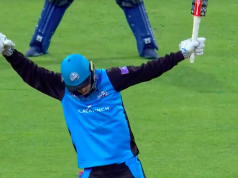 For this was the first Championship match Smith has played in over a year, since suffering a potentially career-ending back injury against Derbyshire. The all-rounder has admitted that there were times when he wasn’t sure if he would be able to return to the cricket field. 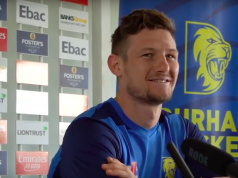 Four months after surgery on the back, Smith has been playing regularly and very well for the Lancashire second XI, before making his first-team return in the T20 Blast game against Derbyshire on Saturday. His inclusion in place of Karl Brown for the Championship clash with Surrey was something of a surprise, but showed how keen Ashley Giles was to get the influential Smith back into the team. Smith was thrilled to be back on the field in the Championship. “I was a bit nervous yesterday, it felt like my first game all over again,” Smith said. “I’m just lucky enough to be back out there playing. There’s been a lot of ups and downs. The club have been fantastic with me every step of the way. “Without the support I’ve had I wouldn’t be where I am now. “I will remember this game for a long time. It’s my 100th Championship game too, so I’ll remember it for a number of reasons. It wasn’t the prettiest of half-centuries in truth. It was a gritty knock, with the milestone eventually coming up from 130 balls. But for Smith it was a significant moment and the desire to reach 50 was there for all to see. Prior to his injury nightmare, the all-rounder was in the form of his life. He was the sixth-highest wicket-taker in Division One, with 52 wickets at an average of 20.46, in addition to racking up 773 runs. Coupled with strong one-day performances, it was form that earned him recognition with the England Lions. He was made Lancashire captain for the following season, before injury snatched that leadership honour away from him. Now back in the side purely as a player, Smith is just delighted to be able to contribute again. “It couldn’t have gone much better for me really,” Smith said. “I’ve played well throughout the winter, my new setup is working well. Opening with Haseeb makes me feel like an old man! “We spoke about roles but I’d have been happy batting at eleven, as long as I’m out there.